Throughout the mid-1970s there were the seeds of a revolution were being sown. After 1975 hobbyist microcomputers such as the Altair 8800 were being offered to the public. After that, relatively low-cost microprocessors such as the Zilog Z80 and the MOS Technology 6502 had been developed into basic systems and board such as the Apple I and KIM-1, but these still were still strictly for hobbyists and engineers. But 1977 saw the first systems that businesses or consumers could buy and use out-of-the-box. Professionally designed and fully functional, these early commercial offerings sparked the revolution that had been brewing for a few years. 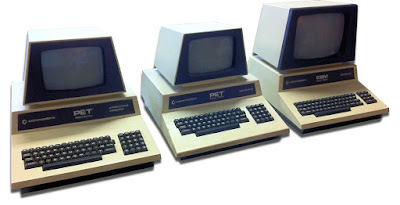 This year saw the launch of three highly significant systems in the US - the Commodore PET, Apple II and Tandy TRS-80. The Commodore PET was announced at CES in January 1977, although the first units didn't ship until October and production levels didn't really meet until early 1978. In terms of announcement date, the PET beat its Tandy and Apple rivals, but those those systems actually shipped to consumers earlier. The name PET stood for "Personal Electronic Transactor", and it was strikingly designed in an all-metal case with an integrated chiclet keyboard and data cassette recorder. Perched on top was a trapezoid-shaped 9" CRT display, giving the whole thing a look reminiscent of a Mesoamerican pyramid. Commodore was no startup company - founded in 1954 it had started with typewriters before moving into adding machines and electronic calculators. Founded by industry legend Jack Tramiel, Commodore had bought Chuck Peddle's MOS Technology to secure supplies of the 6502 processor for use in calculator products. Peddle convinced Tramiel that a microcomputer was the way forward, and since Commodore was being hit by a slump in fortunes after a collapse in the calculator market, the company changed direction. Early PETs featured a 1 MHz 6502 CPU, with RAM options ranging from 4KB to 32KB. Storage was a built in data cassette ("datasette") next to the keyboard, which did mean that on early versions the keyboard was a cramped affair. Over time a wide range of upgrades became available, including floppy and hard disks, printers, plotters and the PET's IEEE-488 interface could talk to a variety of scientific and engineering equipment too. Over the five years of production there were various upgraded models, with better keyboards, bigger screens, more RAM and better graphics. 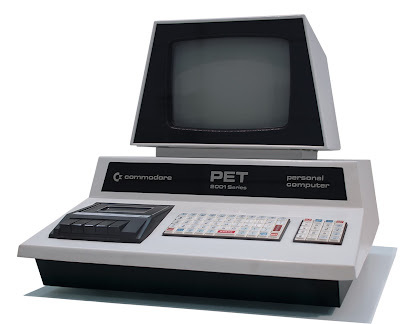 Along the way the cute "PET" name was dropped and the machines took on the name "CBM" (for Commodore Business Machines), but it didn't stop people calling them "PETs". The PET sold very strongly into schools and colleges, thanks to its sturdy construction and reliability. However, the poor graphics capabilities meant that it didn't sell well in the booming home market, so Commodore followed up the PET with the successful VIC-20 in 1980 and the legendary Commodore 64 in 1982, both based on the 6502 processor. The 64 sold in millions and is the biggest selling computer model of all time. Prices today for these machines varies from next-to-nothing up to €1000 or so, depending on model and condition. Although the PETs themselves were highly reliable, disk drives were always less common and more fragile and can be hard to find today. Alternatively, if you fancy a virtual PET rather than a physical one the VICE emulator emulates pretty much all 8-bit Commodore machines and runs on a wide variety of platforms, including Windows, Mac and even Android smartphones.